The Rev. Todd. 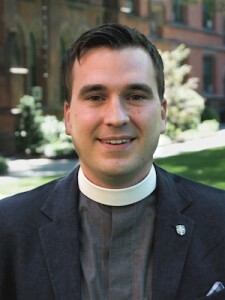 H. W. Brewer, Ph.D., was recently appointed as Assistant Professor of New Testament at The General Theological Seminary. GTS News recently sat down with him to talk about his background and what excites him about coming to General. My wife, Kelly, and I have been married for nine years. She works at the VA Hospital researching balance issues with veteran populations. We moved to campus this summer with our two dogs, Maggie and Belle, and we all love living on the Close. I grew up in The Episcopal Church, the son of an Episcopal clergyman. As a child I participated in everything that Episcopal children do: Baptism, Confirmation, youth group, and so forth, but I never thought I would go into ministry myself. At the time I graduated from high school I loved physics, so I went to college to study mechanical engineering. Sometime into my third year of college I realized what I liked about mechanical engineering was not what it actually was. I liked it because it explained the world and physics and all those sorts of things, but engineering is actually all about screws, nuts, bolts, and springs. During this time, I was quite involved in college ministry. I really loved participating in Bible studies, meeting with other students, serving on the leadership team and thinking through critical questions about the group’s direction and the emphasis on what we needed to do to have a fruitful ministry. As my engineering aspirations faded, I began to think about pursuing ordination, meeting with people and talking it through with them. Soon enough I graduated and went off to seminary. While at seminary—in addition to a love of ministry, and a love of people—I gained a love of the complexity of theology, particularly the New Testament. The more I studied, the harder the questions I had, and the more difficult the questions I had to answer—for myself. As a result of this questioning, I did a thesis about the historical Jesus. That thesis was foundational for me, because it set the questions that dictated the kind of scholarship and topics I wanted to pursue. In particular, I was interested in the question of the relationship between Jesus and Paul. They don’t speak with the same vocabulary. They don’t address the same issues. How do I reconcile these two very significant figures in early Christianity in a way that doesn’t side with one against the other? With that question in mind, I found a supervisor and pursued Ph.D. studies in Durham, England where I studied the interrelationship between canonical and non-canonical gospels. I studied the Gospel of Thomas quite extensively; trying to understand how early Christianity was coming to terms with who Jesus was. What were the methods and means available to them? How did they come to terms with who he was and who he is continuing to be in the life of the church? These are the kinds of questions I found the gospels of early Christianity to be asking and they are the very same questions that dominate the Apostle Paul. Across the board, you can see early Christianity tirelessly trying to grapple with the identity of Jesus and his continuing significance. What did your studies in England and being part of the wider Anglican Communion bring to your experience? One of the things that I learned in England about both the New Testament and the life of the Church is that there is a wide diversity of Christian practices and beliefs contained within the New Testament. Even within that diversity there is a unity that holds it all together—namely a faith in the eternal significance of Christ’s life, death, and resurrection. It allows for a very broad vision of what the Church can be, one that can’t be reduced to single, narrow formulations. While I studied in England, I worshipped at St. Oswald’s in Durham. The church was built in the 12th century, and we had a crucifix from around that time which we used every single week. It was special to be in a place where the historic nature of the church is not something you just hold in theory, but is something you are reminded of every day. It was wonderful to be under that wider, big tent of Anglicanism. It was also fun as well to be there during the changing of diocesan bishops. I had the distinct privilege to be at St. Oswald’s while Justin Welby was there, and to witness his responses to the needs of the diocese before he was called away to be Archbishop of Canterbury. What excites you about your new position here at General Seminary? I’m really excited about General’s vision for seminary education, particularly The Way of Wisdom and its intentionally integrated approach to seminary education. In my research and in my teaching, I’ve always tried to be integrated in terms of how I understand what the text is doing or saying. I don’t see New Testament studies as a silo unto itself, but I have always tried to integrate systematic theology, pastoral theology, and ethical questions at every turn. In many ways, General’s vision for education really fits with what I believe to be true about New Testament study, and is essential for people who are pursuing ordination. When it comes to preaching the text in their ministries, students will have already learned to bring to bear on the text concerns that are beyond standard historical-critical questions. They are ready to explore the issues of systematic theology and of contemporary relevance. General’s vision for that kind of integrative approach fits well with me, and I think it is precisely what is needed. My hope is that students who take my classes will first learn to read the texts for themselves; so that they can acquire the tools needed to sit down themselves, beyond seminary, and be formed by a good practice, to integrate what the text is saying with present concerns and issues and realities. Beyond teaching, in what ways do you see yourself participating in the daily life at GTS? I see myself not just as a professor, but I am also ordained. So I hope to serve as both a professor and a pastor. I look forward to getting to know the students and walking with them in their formation, being concerned not just for the formation of their minds, but also for their wider holistic selves. Seminary is not always an easy time for some people. It is essential not only to be involved academically, but also to be involved at a pastoral level. I also look forward to being involved in Chapel, particularly to model a daily life which is formed by the liturgy, learning and growing with the community together. General is one of the cardinal seminaries of The Episcopal Church. It has a rich history, but it is also quite diverse. You have students who come from a wide range of backgrounds and geographic locations. It’s exciting to be a part of that kind of community because, if you go to a place that is completely monolithic, the kinds of questions that are asked are, by in large, pretty uniform. Diversity is one of General’s great strengths, because it allows for learning through hearing questions and answers from a wide variety of perspectives. Together we can form leaders who have been shaped by that experience of diversity. What you see as the future of General Seminary? I think General Seminary’s future is very bright. Every seminary now is asking hard questions about what it means to provide seminary education—not only because of financial pressures, but also because the changing landscape of American religion. Every seminary is asking, “What does it mean to form leaders for the Church?” General is a place where that conversation is already happening. It’s very exciting for me to be part of that conversation and to see the kind of answers that are coming up, particularly with General’s integrated vision for education and formation in The Way of Wisdom. This is all a very hopeful sign for what is really needed for the Church.